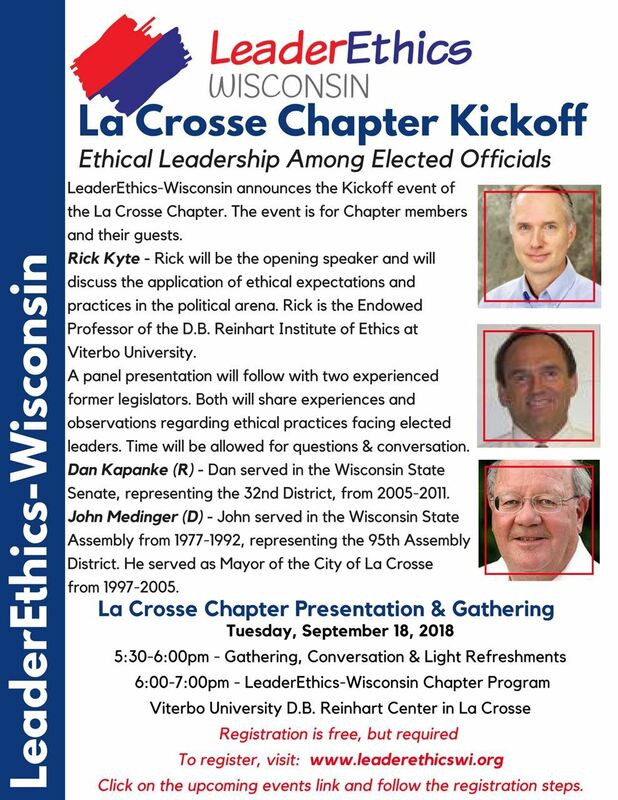 Presentation at Leader Ethics in Wisconsin. When I accepted the assignment to speak at this event, I did not expect it to be challenging to write my remarks. After all, I have been actively involved in politics for 44 years! That’s right, 44 years. I’ve been a volunteer, a campaign manager, a legislative staffer, a legislator, a legislative leader and a lobbyist. But I found the assignment difficult because these are difficult times in the realm of politics and government and it is challenging to encompass all of it in one set of comments. If I had given a speech on ethical behavior when I began in politics, almost the entire focus would have been on the dictionary definition that simply says, “doing what is morally right, not wrong.” At that time, ethical behavior was a huge political issue, and it referred to what today might be called graft or financial corruption. It was largely about people taking advantage of their position to make money. From the time of the Wisconsin Territory, people have questioned the ethics of elected officials. Start with the selection of the State Capitol. Students of Wisconsin History know that James Duane Doty was the man responsible for Madison being selected as the site of the State Capitol. Just 23 days after Doty's survey, the first territorial legislature met at Belmont, which was serving as the provisional capital. There was a raft load of capital candidates, including Belmont, Green Bay and Milwaukee. After 42 days, Madison won by one vote. It was a compromise; the site was between Green Bay and the lead mines, between the Mississippi and Lake Michigan. According to records, Doty almost assuredly bribed delegates and their friends and family with town lots in the new Capitol. One member recorded that Doty also offered delegates buffalo robes in the cold, drafty temporary capitol. Doty, the Wisconsin Historical Society notes in an article, ended up making about $35,000 on the sale of his Capitol site. Fast forward to another critical part of our state’s history. By the late 1800s, Wisconsin was an economically successful state. And the most successful parts of industry literally owned the legislature. Free rail passes for state legislators assured continued favorable treatment of the rail business. Lumber barons selected the US Senator. When a 35-year-old district attorney named Bob La Follette met with Republican leader Philetus Sawyer, he was offered a bribe to fix a court case. That was the last straw for La Follete who ran for Congress and set about changing the power structure in the state and changing forever the view of ethical behavior in politics. But some level of personal graft and corruption continued in politics throughout most of the 20th century. An official 1947 guide for new legislators gave information on free theatre passes, football and basketball tickets and medical care at the University Hospital. Local government officials frequently enjoyed hunting and fishing trips sponsored by road contractors, elected officials often pocketed license or registration fees and representatives at all levels of government rarely paid for drinks or dinner when in their courthouse city or in Madison. So, this level of “ethical corruption” was truly the biggest challenge reformers faced. Wisconsin formalized ethics laws for state elected officials in 1973. At that time, only four other states had ethics laws at the state level. In 1977, the laws were extended to judges and most state officials and in 1979 local officials. Wisconsin became known nationally for our tough ethics standard of elected officials not being allowed to accept any gifts, not even, it was said, a free cup of coffee. From time to time, there were violations of these ethics laws, at the state and local level. There were fines and even jail time levied for fishing trips, air fare, sport coats, Packer tickets, personal phone calls and failure to file ethics reports. But the bottom line is the laws have largely worked. Government corruption, in terms of personal enrichment or personal gifts, has largely been eliminated. And yet, there’s a feeling today that government has become unethical. It’s not that direct unethical financial behavior…. it’s a belief that government officials are not conducting themselves with the standards we would expect from a representative government. This is not a partisan issue, it is a view shared by many across the political spectrum. I do think it is important to state up front that there are many examples where the system is working well. 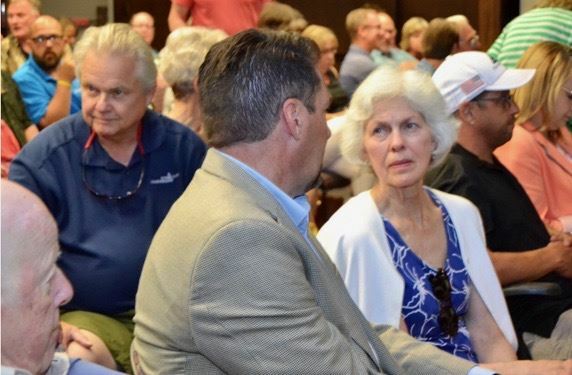 There are many elected officials at all levels – school board, municipal, county, state and federal – who work very hard to conduct themselves and their business appropriately. There are still examples where bills are carefully thought out and debated, and where they even pass unanimously. Although elected from a particular party and a particular philosophy, be ready and willing to work with others who do not share your views if you can find solutions to problems that advance the common good. At the end of the day, recognize that in a democracy there are two tenets which should guide all elected officials: first, that the majority always prevails, but equally, that the minority has a right to be heard and respected. Any objective observer would note that there are problems today with a lack of these core ethical leadership principles by many elected officials. And there’s a feeling by many that our current political system itself has become broken by a lack of these principles and the behavior that follows. Now, as I went through those examples, I bet every single person has in their brain an image of someone who they believe typifies these negative trends that are so destructive of our government system. We might all agree the political system appears to be broken, and much of government action unethical. But we could differ wildly on whose fault it is, and who are the real offenders. Much depends on your perspective and your own worldview of politics. The fact is, there are many offenders and there is much wrong across the board. Find an example of a violation by an elected Republican and you can match it with similar behavior by a prominent Democrat. There’s plenty of blame to go around. So, what are root problems of this dilemma, and what would I propose to fix them? Money – money has been a problem in politics for time immemorial. And it is likely to always be. If you try to take money out of the political process in one place, it inevitably appears in another. What is different in 20 years is the vast amount of money we see spent in races. In my last race in 1996, I spent about $90,000 for State Senate re-election. Today, competitive State Senate races combining all sources of spending, can be in the millions of dollars. When I was in office, individual candidate fundraising was minimal except for the six months before an election. Today, it goes on around the clock. In the past, elected officials felt they needed a base of contributions from their district to show their support. Today, an out-of-state billionaire can provide that much easier and much more effectively. Almost every politician I know says this constant focus on money is the most difficult, demanding and depressing part of the job. Reapportionment – the party in power has always written reapportionment plans that benefit the majority. Both Republicans and Democrats have resisted changing the reapportionment process when they were in power. And district lines are not the whole story -- the minority party has often been able to win elections despite gerrymandering. What is different today is technology is available to draw districts with a fine line to make it highly likely to go to one party or the other. These trends have magnified partisan advantages to the majority and made it exceptionally difficult for the minority to overcome at election time. And, because of the extreme partisan makeup of the districts, more partisan candidates are likely to be the victors in primaries which has an effect overall of making the system more partisan and less cooperative in problem solving. A breakdown of community – When I was in elected office most people watched the same television news and read the same newspaper. They were active in church, veteran, union and civic groups. They went to public schools or parochial schools with deep community roots and all types of people in the desks around them. People of different income levels, experiences, philosophies and career backgrounds interacted in these numerous community arenas. There may not have been political agreement on solutions, but there was a sense of agreement about the problems the community faced. Today, many individuals have withdrawn from that community discussion. They may have no direct tie to a charitable, civic or church group. Their news is from an echo chamber of their choice. They do not know anyone well with a different ethnic or economic background or political philosophy. And many have a wildly different view of what the problems are, let alone the solutions. News sources – Speaking of the news, a major change is the realignment of people’s media sources and credibility. Finding facts, without bias, is becoming very difficult. There’s disagreement on whether facts are truly facts. 24-hour news coverage distorts the importance of disputes and exaggerates reality. To be honest, much of what government did before 2000 was unknown because of a lack of media coverage. It was simply impossible to cover everything happening in government. Today, everything every single elected official does or says is fully available, instantly. And compromise becomes much more difficult with this level of scrutiny. “(Support for Trump) is more than strong. It’s tribal in nature. People don’t ask about issues anymore. They don’t care about issues. They want to know whether you are with Trump or not.” I think all of us have run into this – friends or family members who simply have “joined a tribe” and the case is closed. This is occurring on the right and on the left. So, what’s the issue with being part of a tribe? My view is that a fundamental principle of this tribal view is that your side is right even when they clearly are not. And the other side is always wrong. The tribal view is hardened by members only hearing their own media, only talking to those who share their view, and believing only the leaders of their tribe speak the truth. In the extreme, the tribe even picks which facts are facts and which are not. Defenders of this view say traditional bipartisan government has failed them. One of my former colleagues observed that those of us in government in the past may have misread how unhappy the public was with government. He said we thought they wanted a bipartisan government that arrived at consensus solutions. And he said it is clear the public – or at least a lot of them – view this today as not only a failed approach, but as exacerbating the problems we face. They want a consistency in message and action with no compromise and no consensus. Defenders of tribalism also note that at critical times in our history, leaders saw the failures of consensus and brought about radical change and that these moments of revolution were some of the proudest in our nation’s political history. They note that consensus government supported slavery, and the Republican Party was created to destroy it; and a century later the consensus government sanctioned the civil rights of blacks to be routinely abridged, and Martin Luther King and a host of warriors stepped outside of the consensus to bring that sad legal chapter to an end. I do not advocate that people forget their principles or fail to use their constitutional right to state their beliefs in a solution to a problem. And I do acknowledge there are times when one most stand for a principle regardless of the political cost. But I advocate a return to a belief that we can work toward solutions within the framework of our ideology given the dynamic pluralism of our society and the government structure which is built to encourage compromise and cooperation. Even when you have principles, compromise is not a bad thing if it moves the outcome your way, even a little. Gilbert and Sullivan noted in the musical Iolanthe that one of the issues of government is that members of parliament must leave their brain and cerebellum outside and vote just as their leaders tell them too. In American politics, our partisan tradition has never been so strong as to require straight party-line voting. But modern tribalism, does in fact require members to check their brain at the door. It does not encourage independent thought, or a creative search for solutions. It only requires absolute loyalty. My daily work at Dairyland Power is on behalf of the electric cooperative movement. We came about through an act of the President and Congress way back in 1935. In a world where most businesses and groups have become more and more partisan and more part of a tribe, we fight to stay bipartisan and interact with elected officials of both parties. Hidden in our success, however, is a gem which I think is the answer to the tribalism which pervades our system, and the gridlock it can bring about. The answer is that we approach our elected officials the old-fashioned way…. we tell them what we are about, educate them on the issue we face, and sincerely ask for their help. We often bring 50 or 60 cooperative members to Washington, or several dozen to a Madison office, and we share our views and lobby for change. Polls show less respect for lobbyists than almost any other profession. Somewhere around used car salespeople. That’s tragic, because lobbying is really an important part of the governing process, guaranteed by the First Amendment. It is the right of an organization or an individual to talk to elected officials and tell them how legislative proposals will impact them. It’s education. And if done right, lobbying can still work. We continue to press our issues and causes this way. This old-fashioned way of impacting government works, but we know today’s elected officials feel the pull of the tribe. They are cautious about stepping out of their secure zone on issues. The tribe dominates their thinking and stokes their fears. I have had countless conversations with officeholders of both parties who indicate privately they wish they could work at solutions, at consensus, at problem solving. Some of these people would be known as radical conservatives or ultra-liberals. They feel, however, constrained by the tribe. They know that thanks to money, media, reapportionment, breakdown of the community and their tribe, if they waver they will be defeated. They are good people. They are smart, principled, and have the best interest of their country at heart. But they are afraid to be bold and buck the tribe to represent the collective interests of their constituency and be a unifier, not a divider. The challenge I have for the people in this room, and for those who care about politics, is that we need to build a new movement that supports politicians who can reach across the divide and work to solve problems. If this country would develop a new movement that specifically supported elected officials who would work for consensus, politicians would respond. My fondest wish is that a new national news network would be launched with an emphasis on consensus building and problem solving. It might change the public square debate and support candidates who have that agenda. Those who would lead such a movement need to be careful, however, to avoid the same traps that we seek to overcome. It is so easy to condemn one elected official and overlook the same types of sins committed by another. It is so easy to have one standard of behavior for one issue and a totally different standard for another. 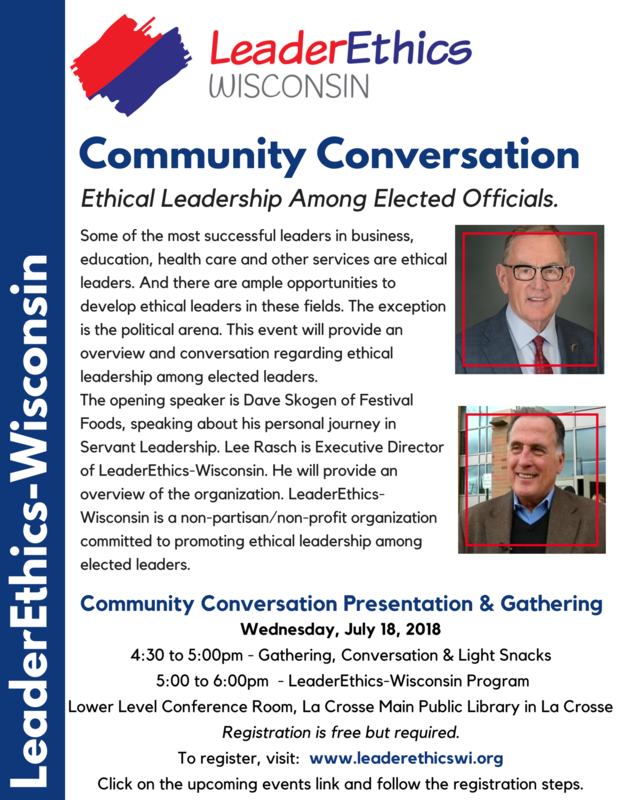 LeaderEthics is a great initiative because we are coming together to talk…. talk about what we ask for and expect in our elected officials and how we can raise the bar to go there. Conversation is what is missing between the tribes. And this initiative inspires conversation. I believe there will come a time when we will turn from the negatives which are making our government such a divisive and ugly place today. I believe we will see a return to civility and discussion of issues and finding ways to achieve common ground. And I believe you are here tonight, spending your time to think about making the world a better place, are where it can begin. I encourage you to continue that support. And be willing to represent the collective interests of your constituency. Step up and ask your elected officials to strive for this kind of ethical behavior. And sometime soon, we will see change in how our elected officials do conduct themselves. 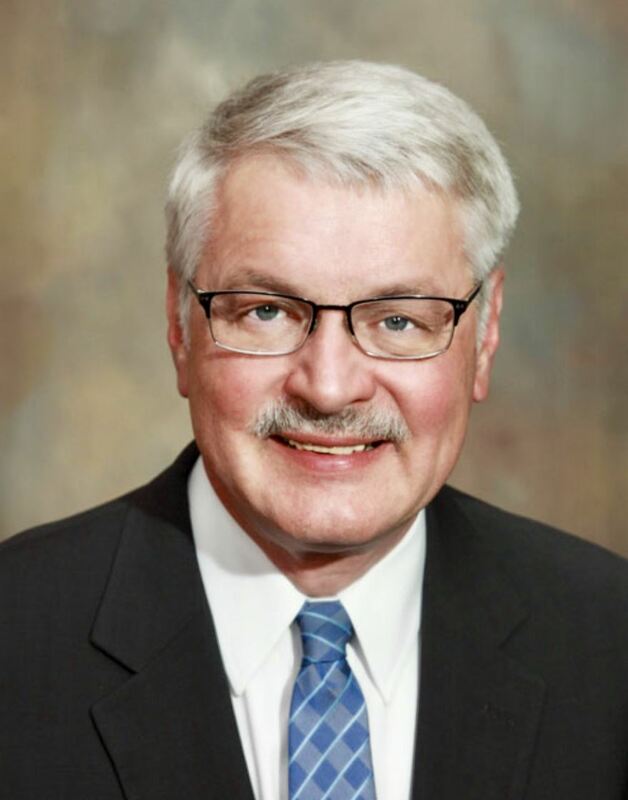 Lee Rasch spoke at the Rotary Club of La Crosse regarding the importance of promoting ethical leadership among elected officials. There was a good discussion at the Community Conversation.